This topic will tell you where the best place to farm a certain DATA is at. Farming Digimons with Merc will net you a merc egg which you can scan to get data or digicore, maybe hatch. [EDIT] I'll add the areas where they are at later. Gizumon AT Level Range(46+, depends on F2) Best monster to get Rock Data from! Impmon Level Range(6-15)[Merc] A good one to start with if you're leveling and farming. For Devil Data, I guess you can kill Devimons (no merc) when you're around level 18-26. NeoDevimons (no merc) when around level 35-43. Yes they give IMPMON eggs, you know... your favorite Digimon. They are great to farm. I never got Impmon eggs from them!! D: Wait, you mean from SkullSatomon, right? Then yeah, I was thinking that. Updated, farming digimon with mercs will net you an egg to scan for data or digicore. Still researching other stuff though. I'll tell you where a good place to farm data ISN'T. ritzbitz8 wrote: I'll tell you where a good place to farm data ISN'T. The Icey Area doesn't seem to be a good place to farm anything but rock data. If possible, if you're farming Aqua Data please tell which digimon has a good drop rate; it'll help a lot. oh, I noticed that a good way to get aquatic data (well, its not good but works very well during non-exp events) is to just hatch a 3/5 something like kunemon and go kill the lowest level betamon. well how many possible targets are there? Betamon, Ikkakumon, Seadramon, ... Vikemon? tell them to look at this if you don't want to give them data or don't have it. 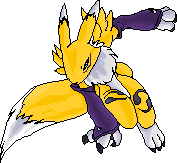 I don't know if it deserves to go into the list, but the Renamon in Frozen Ground (level 40) drop accelerators very often. Yet he's allowed on online games. I do not get this logic!! Koromons are now good to grind for dragon data. The highest levelled koromon is 9, and there's that 8 levels drop penalty now, so ... from level 1 to 17 maybe? Seems like they are trying to sell stuff now instead of making players happy... Hmm. Sad... They already cut the droping rate, stating that bots would take over, and now this. What's next? Also, about the bot, I think it's an invalid argument, as when we load the game, the game load an anti-cheat system. Unless that is fake? They didn't cut the drop rate. They actually even decreased the penalty for it! Ugh, the horror of mass bits lost. Man Dragon Data are Money Suckers, but yet Money makers! If you're leveling check out if Ryuudamon and other digimons have better dragon Data drop rate please! Is SkullMeramon really the only way to get fire data? Nah. There are other enemies that drop fire data (Meramon, Candlemon, Demi-Meramon) but DarkSkullMeramon are the best source of fire data in the game. why no Plant DATA on the list?